Lean manufacturing is the concept used to identify potential waste in industries to survive in competitive market. Lean concept was introduced by automotive firm known as Toyota Production System (TPS). The need of lean facilitates increase in productivity. Value stream mapping (VSM) is a lean tool to identify value-added and non-value-added activities in production line. 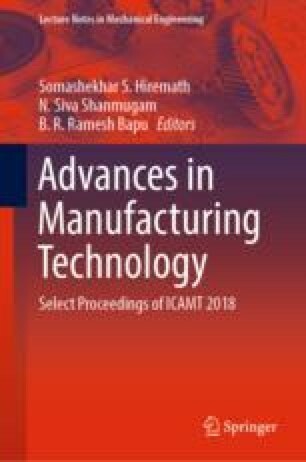 This chapter focuses on studying the current state map of an automotive firm and to implement value stream mapping (VSM) to design future state map using appropriate lean tools to increase the productivity and eliminate non-value-added activities. The study was conducted on crankshaft line of an engine shop in an automotive firm. After conducting study, successful implementation of the VSM tools resulted in the reduction of cycle time by 56, 227, and 155 s of oil-hole drilling, induction hardening, and grinding, respectively. The productivity was improved by 24 units on an average after complete implementation of future state VSM.